to engage students in meaningful sessions outside of the traditional classroom setting through a wide range of practical activities including woodcraft, ceramics, outdoor cooking, story-telling, horticulture, bushcraft, etc. to increase experience, enrichment and opportunities for the learning and development of skills. Since its launch in September 2011, the Rural Skills Department has grown in size and diversity and now features a timber framed roundhouse shelter which is used as an outdoor classroom, complete with cob oven and fire-pit. Other facilities include an allotment with raised beds and poly-tunnel, and a green woodworking shop complete with pole-lathe, a potters kick-wheel, and wool spinning and weaving equipment. 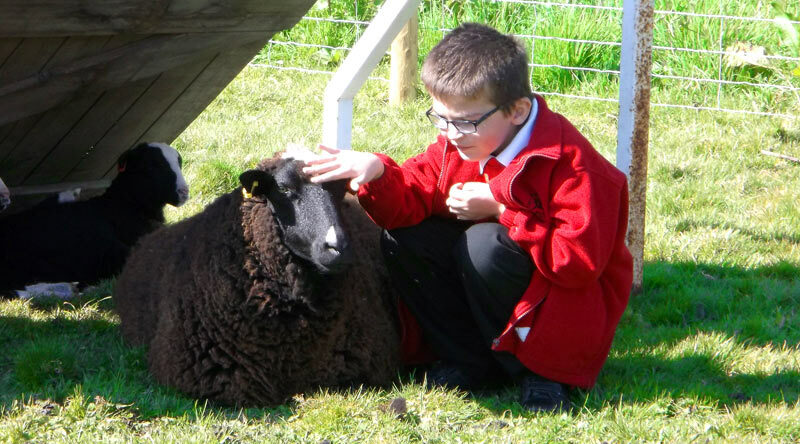 In addition to this, we have a number of chickens, guinea pigs, sheep and goats, all of which are located within a wildlife friendly site on the school grounds. Students are referred to the project leader on a case by case basis and timetables are then tailored by class teachers and Rural Skills staff to meet individual needs. Many of our students find traditional classroom environments particularly challenging. By tapping into the wealth of opportunities that can be found in nature, we offer young people the chance to benefit from a far greater breadth of learning experience and enrichment. Engagement with the outside world. Showing an interest in the world in which they live. Learning about the needs of living things. Understanding that the owner has a responsibility to meet the needs of domesticated animals so they remain healthy and happy. Showing care and concern for living things and the environment. Links with the science curriculum (esp. biology).